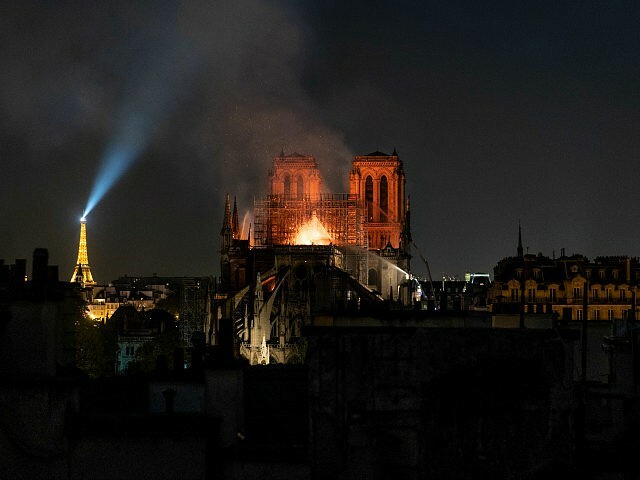 “With shock and sadness, the Holy See received the news of the terrible fire that devastated the Cathedral of Notre Dame, symbol of Christianity in France and the world,” reads the communiqué, which the Vatican made available to Breitbart News. “We extend our closeness to French Catholics and to the people of Paris and ensure our prayers for the firefighters and those who are doing all they can to deal with this tragic situation,” the Vatican said. The massive blaze engulfed the iconic Notre Dame Cathedral in central Paris Monday afternoon, destroying the ancient timber roof, bringing down the central spire, and threatening the bell towers. The cathedral has been in the process of restoration and, in the past days, has had sixteen bronze statues removed from the roof area to facilitate work. The fire appears to have started near the roof where work was taking place. Although no suspicion of foul play has been reported, France has recently suffered an intense period of attacks on its Christian monuments. During March, a dozen Catholic churches were profaned across France in the period of just one week in what appeared to be a clear case of anti-Christian vandalism. Both police and ecclesiastical leaders remained silent as the desecrations spread up and down France. In one of the more recent cases, marauders set fire to the church of Saint-Sulpice — one of Paris’ largest and most important churches — shortly after the twelve-o’clock Sunday Mass. Police determined that the Saint-Sulpice fire was the result of arson. The restoration of that church from the damage caused by the fire will reportedly cost several hundred million euros. The extensive damage to Notre Dame Cathedral will likely cost far more.